You cannot go to London and not visit the splendid City of London. In order to get there, you can take a taxi from Stansted that is both comfortable and affordable. Very few notable historic structures in the City have survived until date. Most of them have been destroyed or affected by post-Second World War redevelopment, bombing and fire. The ones that are still standing and that tell the district’s history are the numerous churches, the Mansion House, Dr. Johnson’s House, the Royal Exchange, the Guildhall, St Paul’s Cathedral and the Monument (Monument to the Great Fire of London). The design of the majority of the landmarks has been signed by Christopher Wren. The Temple region has been heavily bombed during the World War II and the only historic survivors in the area are Prince Henry’s Room and 2 King’s Bench Walk. The City also bears small parts from the former Roman London Wall. They can be seen around the Barbican area and the Tower of London. The Staple Inn, locate in Holborn, has also been damaged by bombs and restored in the following years. The City of London also accommodates 20th century buildings that have been listed as Grade II structures. These are the Bracken House and most of the buildings in Golden Lane Estate and Barbican. The City does not incorporate the famous Tower of London, but it does attract numerous visitors to the City’s south eastern part. The area is also home to various high-rise structures that will definitely draw your attention. Some of the most renowned are the Lloyd’s building, the Smithfield Market, the Old Bailey and the Bank of England. 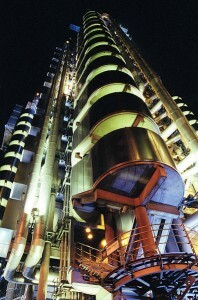 The Lloyd’s building is one of the most unusual structures in London. It accommodates the Lloyd’s of London insurance institution and it features radical Bowellism architecture, meaning that the lifts, the ducts and other building services are placed on the exterior. In 2011, the structure was listed as Grade I and it was named one of modern epoch’s key buildings. In order to get rail transport from London Stansted Airport to City of London, you have to take the train to Tottenham Hale Underground and from there the London Underground Service to Victoria Underground Station. There are also other transfer options such as using a taxi service from Stansted Airport or Tottenham Hale Underground to City of London. So as to travel by car from London Stansted Airport to City of London, you must use the M11 motorway. London Stansted Airport is 41.1 miles away from City of London. A London Stansted Taxi to City of London with 247 Stansted Airport Transfer is going to last around 1 hour and 35 minutes. The price for a taxi from Stansted Airport to City of London starts from 57 GBP for a saloon car.